Video of a police dog in Spain is going viral after the pup was filmed performing CPR on an officer. 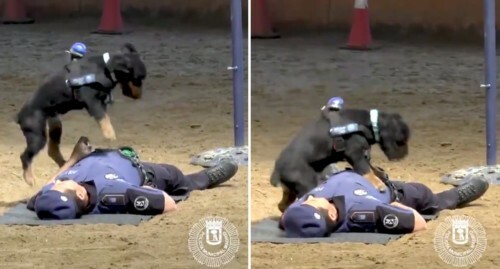 A video of Poncho, a police dog from Madrid, is going viral thanks to the pup’s heroic actions with a human officer during a recent drill, as ABC 33/40 of Birmingham, Ala., reports. The video posted by Madrid’s police department shows the animal leaping into action after the officer feigns an attack and falls to the ground. By using its weight to repeatedly launch itself onto the man’s chest, Poncho apparently is able to perform the chest compressions involved in CPR. Though it stops short of offering mouth-to-mouth resuscitation, the dog also appears to be monitoring the man’s pulse by resting its head against his neck. The video is aimed at encouraging pet adoption, but it also raises an important question: Could your dog save your life? While Poncho’s CPR training is a rarity, dogs have been credited with rescuing their owners by calling 911. Perhaps it’s time to sign up Fido for a first aid course?